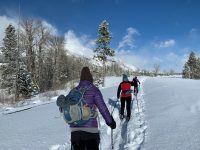 MOOSE, WY- The Teton Park Road between the Taggart Lake Trailhead and Signal Mountain Lodge is cleared of snow and open to non-motorized recreational uses such as walking, bicycling, and rollerblading. 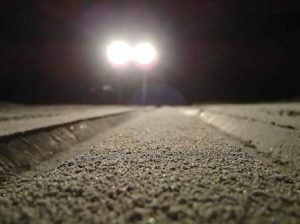 Recreationists are cautioned that snow and ice may persist on some sections of the roadway creating slick conditions. Recreationists should also be alert for park vehicles that periodically travel this roadway for administrative purposes as spring opening operations continue. Road crews may be clearing auxiliary roads and wayside areas, and visitors are cautioned to keep a safe distance from rotary plows and other heavy equipment. Several portable restrooms are temporarily located along the road for recreationists. Dogs are permitted on the Teton Park Road. Dog owners are required to use a leash no longer than six feet in length and are required to clean up after their dogs. Waste disposal bag stations are located at each end of the road. 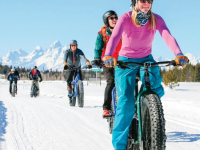 Electric bicycles are not allowed on the Teton Park Road when it is closed to motorized use. 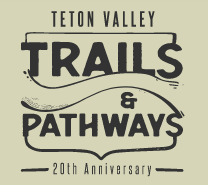 This 14-mile section of the Teton Park Road will open to public motor vehicle traffic on Wednesday, May 1, 2019. The Moose-Wilson Road, Antelope Flats Road and Signal Mountain Summit Road remain closed to vehicle use. All park visitors should respect road closures and look for signs posted near the road regarding any recreational use or access. For information on park roads call 307.739.3682 or visit https://www.nps.gov/grte/planyourvisit/roads.htm. The paved multi-use pathways in the park are open whenever they are predominately free of snow and ice. The Craig Thomas Discovery and Visitor Center in Moose will open Monday, April 1. 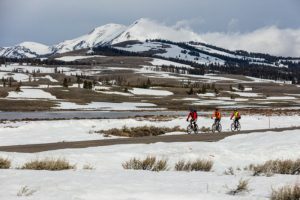 It will be open daily from 10 a.m. to 4 p.m.
As conditions allow, bicycles will also be permitted from the East Entrance to the east end of Sylvan Pass, and the South Entrance to West Thumb. Check the Spring and Fall Bicycling web page for road segment status. 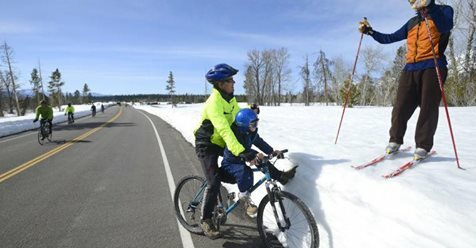 There is no bicycle access to Old Faithful or Canyon until those interior park roads open to public motorized vehicle access on Friday, April 19. We need your feedback! Please take a few minutes to complete the TC/J Parks & Recreation Survey before April 15th. 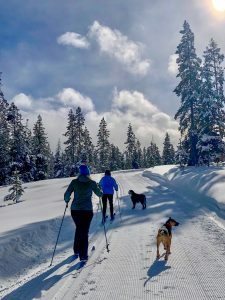 Your feedback is highly valued to determine grooming for Nordic skiing, fat biking, walking, snowshoeing , plowing or packing of snow covered trails. Saturday -March 30th – TC/J Parks & Rec trails-last day of grooming – Game Creek is finished. 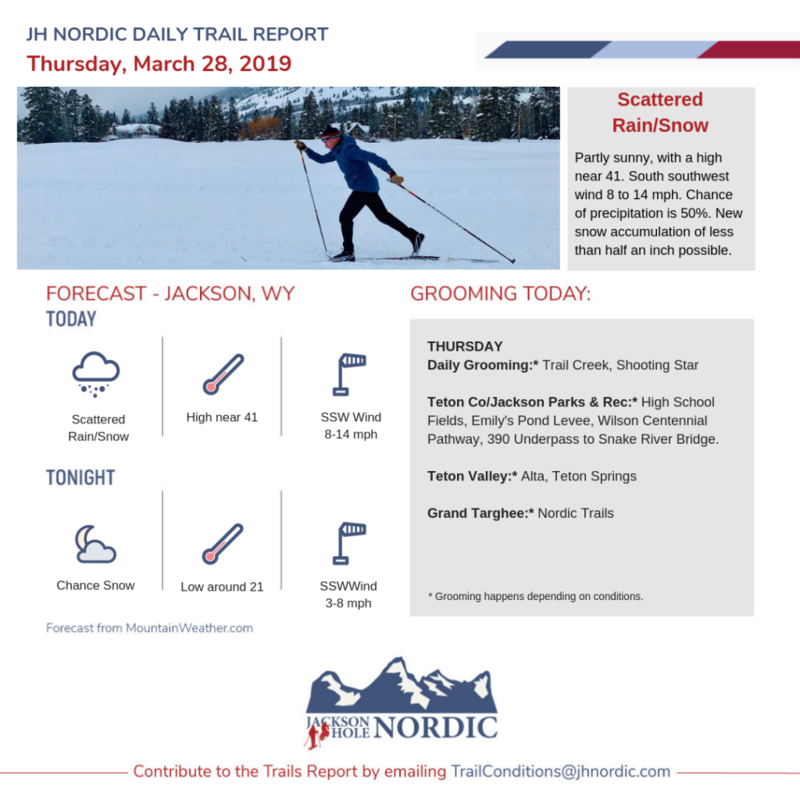 April TBD – Teton Canyon and Teton Valley TVTAP groomed trails (N.B. 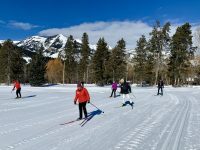 skiing may still be permitted once grooming has ceased: *Teton County/Jackson Trails and Pathways allow skiing, biking, walking all year long. Yeti’s Loop is done grooming for the season. woods with a few of the minor trails receiving a pass as well. Reports from late yesterday afternoon indicated that the woods have been skiing pretty well throughout the day and so far not getting too soft in the afternoon. The fields were a bit soft by late afternoon yesterday and the close woods still have plenty of moose and elk activity and residue. Unless snow forecasts increase the next tentative grooming will be Wednesday evening. 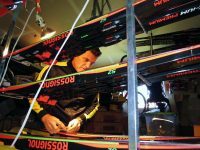 Groomer’s choice for today is to watch the thermometer when planning your ski. Grooming is finished for the season. *Thanks for a wonderful winter Jackson and JH Nordic Alliance! Big thanks to Turpin for hosting the Annual JH Nordic Alliance Free Nordic Ski, Fat Bike, Snowshoe day in January. Mark your calendar for the 4th Annual Free event next year on Sunday, January 5th 2020!! 10:30am: May Park is groomed and in decent shape. It will be a bit soft but should ski OK. A reminder, the Cache Creek trailhead is closed so there will be no grooming there. 7:30am: Cache Creek will not be groomed because the trailhead is closed. I am currently grooming Game Creek and should be done around 8:00. It is coming out nicely. Three Creek Pathway will be done around 10:00. GTNP Road is now free of snow and open to non-motorized traffic. Last grooming day was Friday March 22. The trails continue to groom out well, and Nordic skiing should be quite enjoyable! Uncertain weather in the coming days could change conditions. Quite a few moose have been calling the course home for the past couple of days, so please be aware of a chance encounter – especially around golf holes #6, #7, and #8. Another day of warmer temperatures and mostly cloudy skies. It’s like the flakes are thinking about falling, but just haven’t decided to yet. They will soon though, snow is coming. 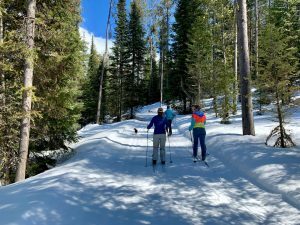 Cross Country/Fat Bike 15k: XC OPEN (Last groomed AM 3/26/2019) – No Classic Track Set, Fat Bike OPEN. *Note: Sorry to inform folks that the nordic grooming cat with our classic track setter has suffered mechanical issues that are not able to be resolved for the rest of the season. Consequently, there will be no more classic track grooming for the rest of the season. However, grooming of the skate track and fat bike trails will continue as conditions allow. Most trails have been groomed this morning. More or less 1″ of new snow. Warming up quickly. Expect trails to be good until late morning, then softening as the day goes on. There is a calf moose in Lower Surveyor Park trying to make a living. Please control your dogs. The cars are out of the Kelly Park and the trail has been repaired. The classic track turned out pretty crisp in most places to make for great skiing in the morning while still firm. The skate lane took many passes to get smooth and somewhat level. I’m pleased with how it turned out despite the challenging conditions. It will probably ski the best with just a little bit of sun on it, but don’t wait too long or it will turn to mush! What beautiful spring skiing! Talked to skiers today. “Skiing is really good am. Slushy late.” No grooming today. Trails looked good and were quite firm. Sorry, woke up late and had to get to work. Skating should be descent with a half inch on firm when I walked it last night. Will try and groom Monday eve! Tuesday afternoon: Reset the south classic and skate tracks late afternoon. Both turned out well. Skate should be quite nice tomorrow morning. The course skis pretty fast, but the classic is fading away. Thursday morning’s groom might fix it all… BTW, there’s a black balaclava and a black cloudveil cap at the base of the course rules/map, if you’ve lost yours. Just finished grooming the Yeti. It always takes longer than anticipated…so much hair. Anyways, classic track is set for counter-clockwise skiing and the skate lane should be amazing. The trail is rather narrow so pay attention and stay in control. Don’t forget about the orange donate button. 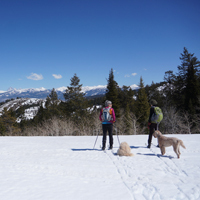 **3/26 – We will no longer groom Yeti’s Loop this season, however ski conditions are reasonable for classic xc skiing. Trails closed for wildlife. Please respect closure till snow recedes. Trails were all groomed Saturday evening and are in really great shape! Go ride and enjoy!